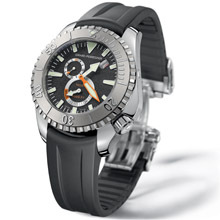 Girard-Perregaux presents a new interpretation of the Sea Hawk Pro 1,000M. Immediately recognisable, its luminescent orange minute hand strengthens the inimitable style of this robust diving watch. 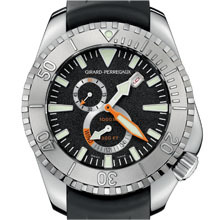 The name "Sea Hawk" has been used by Girard-Perregaux since the 1940s to designate models designed for use in extreme conditions. In spite of the significant evolutions and developments of the Brand in the field of diving watches, the collection's current design was conceived in 2002. Its style is characterised by generously-sized cases and a crown at 4 o'clock which is protected by an original, ergonomic crown shield. The latest creation in the Sea Hawk Pro 1,000M range features a display on which its functions stand out clearly on a matt black dial. The bright orange touches on the minute and small second hands and on the power reserve indicator add dynamism to this bold diving watch, ensuring optimal readability of the dial even in murky conditions. State-of-the-art technology and watchmaking expertise guarantee superb performance, including water resistance down to 1,000 metres to comply with standard ISO 6425 relating to diving watches. The GP033R0 movement with automatic winding and the case have been entirely developed and produced by the Manufacture. The case is equipped with a screwed crown, a unidirectional rotating bezel in steel to enable the dive time to be monitored, and a helium valve allowing decompression of the watch after deep dives. The screwed case-back of this sporty, technical watch is adorned with engraving work symbolic of the Brand. The porpoise, anchor and trident of the engraving are a reference to a Girard-Perregaux patent which dates from the end of the 19th century, and at the time were accompanied by the inscription "Do nothing without advice". 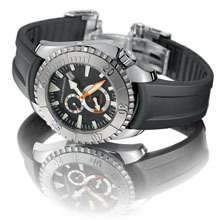 The Sea Hawk Pro 1,000M is available with a rubber strap featuring a folding safety clasp. Its extension system allows the strap to be easily adjusted in order to compensate for differences in temperature or to enable the watch to be worn over a drysuit.